Kiley Sosby delivers a pitch during the season. She is now in the OHSAA record book seven times under six different categories in Individual Pitching. 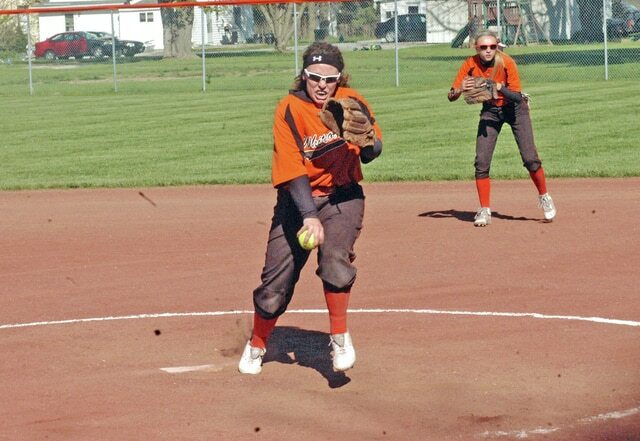 Even though spring sports are behind us and summer is in full swing, Whiteoak’s, and future Bowling Green softball player, Kiley Sosby, continues to collect accolades. The Ohio High School Athletic Association updated their state record books this week and Sosby’s name now appears seven times in six different categories under Individual Pitching. Sosby is now on the list for strikeouts in a season with 355; eighth in career strikeouts with 1,187; on the list for perfect games with four this year; also on the list for no-hitters with seven; and she is now second all time in the state record book for most consecutive innings pitched without giving up a walk with 86. She was already on that list for the 2014 season for tossing 63 1/3 innings without a walk. She also appears on the list for a 20 strikeout performance in the 2014 season.